It may just be the most amazing writers’ retreat ever. I’m going to go out on a limb and say it is. This summer, I’ll be in Transylvania for the Horror Writers’ Workshop. What better place to craft a scary story than in the shadow of Bran Castle, which inspired Bram Stoker as he was writing Dracula? Or inside an actual haunted house? The Horror Writers’ Workshop is hosted by Richard Thomas, an author of five books, including Transubstantiate (Otherworld Publications, 2010) and Disintegration (Random House Alibi, 2015). He will be holding workshops and one-on-one critiques each day of the week-long event. I’ve never met Richard, but he’s already been extremely welcoming and gracious, which is impressive, considering I registered on Saturday night. The same can be said for the conference organizers. This workshop will not disappoint. I’ll be able to visit the house where Dracula was born, along with a notoriously haunted forest. I’d always thought the vampire legend was something trotted out for tourists, but Tausha Johnson, one of the workshop organizers, tells me that isn’t the case. “Transylvanias are seriously superstitious. For them, vampires and the living dead are not just folklore,” she said. 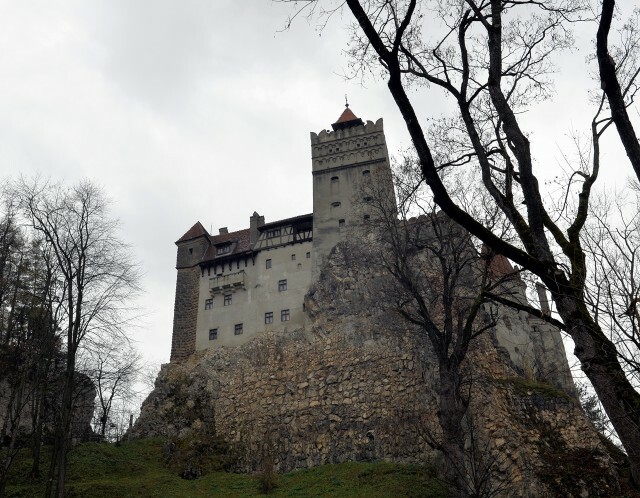 As a horror writer, visiting Romania has been on my bucket list forever, and I’m so excited to be able to walk the same streets as Stoker and Dracula. If this sounds like the perfect retreat for you, there are still five spaces left! A deposit of 350 Euros will hold your space. Have you ever been to Transylvania? If so, what did you think? It’s definitely the ultimate location for a horror writers’ workshop, but I’m curious…for those writers who work in other genres, where’s the perfect place for you? Where would the ideal romance or fantasy-writers’ retreat be held, for instance? P.S. If you like this post, you’ll love my round-up of some of the spookiest places in the world. Photo credit: Jaysmark. View license here. Congratulations! It sounds like a great opportunity. I can’t wait to see what you make from it. Thanks so much, Samantha! I am SO excited. It’s hard to concentrate on anything else. I’ve wanted to go there forever, and this is an amazing opportunity. I’m practically guaranteed to meet some great people. This writer’s retreat sounds amazing! I’m a little jealous, I would love to attend, but since I don’t really write horror it would really just be for the history. I’m SO curious to know how it feels to stand in Dracula’s house, so you’ll have to let us know! I don’t know that I can pick one location for the perfect writing retreat. I usually like to travel, visit different places, and let it influence my writing when I get home. Hey Crystal! The course description says it’s perfect for anyone who writes books that have some elements of horror. I would say yours definitely qualifies. It’s dark fantasy, is it not? It’s going to be strange eating in Dracula’s house (apparently it’s a restaurant now) but I hope they kept as much of the original structure and design intact as possible. I’m the same way about writing and travel. But it’s a fun exercise. For your books, it might be interesting to go to the Holy Land, let’s say. OMG is that not the most awesome thing ever? I always avoid writer’s retreats because…bleh. Writer’s conferences are very inspiring, but in a locale like that…how can you resist?!!!! That’s a conference of a lifetime. Thanks, Stephanie! Yes, this is more of a workshop than a straight-up retreat. I haven’t had much luck with retreats, either, but I’ve learned to not expect to get much writing done. It’s all about the networking, and in this case, sight-seeing and exploring. Thanks, Madeline! I still can’t believe I’m going. It sounds so perfect for me. I’m so glad you decided to go ahead and do this. It’s going to be the trip of a lifetime, especially for a horror writer! Thanks Elle, and thanks for always encouraging me! Not everyone understands my crazy dreams. This will guarantee that 2015 will be one of the best years EVER! !!! I am almost speechless–and I AM totally jealous (in a super happy for you way, of course 🙂 ). What an amazing retreat. I know it will be crazy-wonderful. Have the best time! Thanks so much! I’m really excited about it. And I haven’t forgotten about our scary interview. I’ve just been so behind. But it’s coming! Oh, that’s so pretty, Donelle! It would be perfect for you. Have you ever been? Thank you so much for your kind words, Holli! We’re all looking forward to meeting you. It’s true, Transylvanians are extremely superstitious. We’re trying to book a medium to come give our group a reading, but many places are fearful of what she/he might invite into their establishment. And yes, the workshop is open to all horror sub-genres, as well as anyone who would like to expand their writing. Many elements of horror (such as atmosphere, setting, suspense…) are valuable for any genre. Thanks for writing this. My favourite blog post ever! Can’t wait to meet you in July! Thanks so much, Tausha. I appreciate all the help and information you’ve given me so far. I agree that many of the elements of horror are great for any genre. Who doesn’t want more suspense, tension, or conflict in their writing? It makes any story more exciting. I’ll be at the Horror Writers Workshop, too! I’m just emerging into writing fiction and I tend more towards fantasy and magic in realism that bloody horror or mystery. I’m taking this workshop to stretch my pen. My published work is non-fiction technical information and education. I teach language arts, art, and natural science. I’m happy to find you and your horror writing! I can learn much from writers like you who have a way with darkness and suspense. I’m more comfortable with dark photography and illustration and I know I can write dark stories with a little more encouragement and confidence. See you at the Castle! My published work is mostly non-fiction too, but journalism and public relations. I’m also an editor, both developmental and copy-editing. Omgosh! So cool! Have fun!!! I agree, it is the coolest thing ever! Super pumped and excited! I’ll be blogging up a storm!